UPDATE 9:30 a.m. ET: The FBI is on the scene. UPDATE 9:18 a.m. ET: Rep. Roger Williams was also shot. Williams was not shot, however one of his staffers was hit. 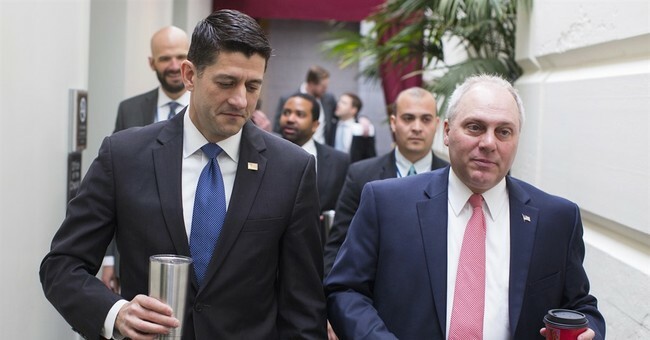 Republican Congressman and House Majority Whip Steve Scalise was shot early Wednesday morning in Alexandria, Virginia while practicing for the Congressional baseball game at Eugene Simpson Stadium Park. A number of staffers and Congressmen from the Republican team were targeted. Scalise was shot in the hip and is reportedly in stable condition. His staffers and two Capitol Police officers were also shot. One of the officers was shot in the chest. At least five people were hit. "He was dragging his body from second base to the infield to get away fro the shooter," Rep. Mo Brooks, who was at the scene and applied a tourniquet to Scalise, described to CNN. "My adrenaline is raging. It's never easy when everyone around you is getting shot." "A pistol against a rifle is not a fair fight," Brooks continued, describing "ten to twenty rounds" coming from the assailant through a fence before the security detail engaged. "Once they started engaging, they exhibited great, great courage," Brooks said, adding that it "seemed to take forever for officials to know we were under attack." Rep. Ron DeSantis, who was at the practice this morning, said a man asked him in the parking lot whether they were Democrats or Republicans. Republican and Democrat teams practice separately. Rep. Mo Brooks on CNN says the gunman was hiding behind the dugout for protection during the shooting. The situation lasted for ten minutes. The assailant has reportedly been shot, apprehended and taken to the hospital (there are conflicting reports the assailant has died). He reportedly sent out at least 50 shots, which means he reloaded and brought enough ammunition to the scene to do so. ALERT: APD investigating multiple shooting 400 block E Monroe St. Suspect believed in custody. Stay from area, let emergency vehicles thru. APD PIO heading to scene, updates will be posted when available. Victims being transported to hospitals. The Congressional baseball game is set to take place tomorrow evening in Washington D.C. This is a breaking story, stay tuned for updates.